On a different subject, Spring Fashion Week is coming to a close. *Tear* I’m having such fun that I might incorporate this whole posting outfits pictures as an occasional feature. I’ll have to keep bribing Lexi with mango smoothies (and perhaps chocolate chip cookies?) to do that, though. Maybe if you guys leave abundant, and well deserved, praise for her work in the comment section that will help too! Since, I'm full of suggestions today, apparently... You should also check out Spring Fashion Week central. Emery Jo's blog is where it's at, fo'sho. Today, I have a “demure” look for you. 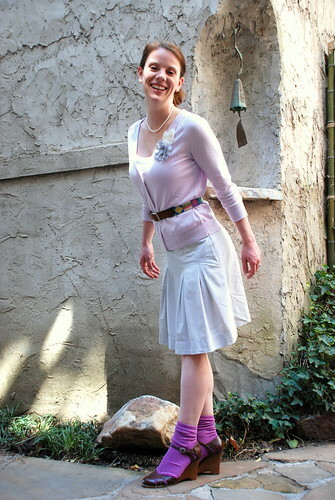 *The lilac embellished cardi is an Old Navy find and I’ve got a basic white cami underneath. *The striped skirt is made by J Crew. *I got the lavender socks from target. I’m so excited to be trying out the whole socks and heels thing I told you about! *These brown shoes have been in my closet (actually, several different closets) for YEARS. I haven’t a clue from whence they came. *The belt, I made myself when I was in High School. It was all the rage then, but I still love it now. *The pearls are a beautiful family heirloom that my mother in law (who has a jewelry collection to DIE for) passed to me! They’re Mikimoto and I always feel like a lady when I wear them. I read that to look "great" in posed pics you need to wear a berry lip color and stick out your boo-tay. Never, not even one time in my life have I liked a picture of me that shows my birthmark. This photo changes my WHOLE perspective. By the Way, It’s Thankful Thursday around here too. But the list of things I’m thankful for is so long right now, I can’t really nail it down to one. And for those of you visiting for the first time, let me make it VERY clear lest you think life is always sunshine and roses around our house. IT. IS. NOT. But, I received some wise advice this week. A friend said, “This season will end.” She wasn’t being snarky or pessimistic or a downer or anything. She was just being real. She reminded me to enjoy every moment and be thankful. So, I am. Believe me. I absolutely love this outfit...and I'm dying to try the socks and heals look. You've nailed it!! LOVE! Socks and heels! Fun!! And I absolutely love those shoes. They are adorable. that cardigan is to die for, and the purple socks only you and pull off. so cute. Love it. Of course. Everything looks splendid on you! And yes, dance was fun. I'm going again in the morning since I've declared it spring break for the oldest. Woo hoo indeed! 9am is dancing time, baby! simply beautiful, i love socks with shoes and your location looks heavenly! Beautiful! Love the socks with heels! You definitely got the demure look, especially with the pearls. Lovely. And you've definitely got the legs for socks and heels. You look so cute!! Now maybe you will listen when I tell you that you have great legs. I love the sweater and the socks are perfect.